Infiniti Podium Lounge Monaco – F1’s new A-list party. 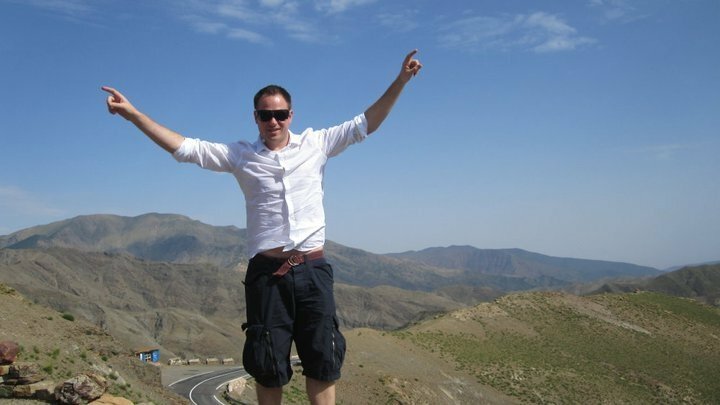 If you’ve hung around here for awhile it’s no secret that Irresponsible life loves F1 racing and parties. Now we are pleased to let you know of a brand new A-list experience coming to the Monaco Grand Prix for the first time this year. The Infinity Podium Lounge Monaco. In recent years the Podium Lounge has developed into the must-do after party at the Singapore, Melbourne and Abu Dhabi races. Now the Podium Lounge comes home to the centre of F1 opulence, glitz and glamour in the principality of Monaco during F1 weekend 23 – 25 May. The after-party, which runs over the Friday, Saturday and Sunday nights, promises to be almost as epic as the on-track action with big-name DJ acts including Dutch superstar Sander Kleinenberg, the iconic Danny Rampling and legendary UK DJ Seb Fontaine. Each night will also include a fashion show by the acclaimed London designer Nina Naustdal. If you want to prove you’re the ultimate F1 fan, then rare F1 memorabilia will be on offer via auction for those with deep pockets. Lots include a framed 1990 Monaco Grand Prix program signed by Ayrton Senna and a racing helmet signed by all the drivers of 2013 Formula 1 season. The Infiniti Podium Lounge Monaco will be held at the renowned Zelo’s on Avenue Princesse Grace, in the heart of Monte Carlo, but if you want to take it up a notch theres also the Infiniti Podium Lounge tri-deck superyacht moored in the harbour. Providing six-star service and a perfect spot to watch the cars through the Nouvelle Chicane. VIPs will also be transported to and from the event in dedicated Infiniti Q50 Hybrid cars. If you are an Infinity fan their new concept, a super-luxury re-imagining of the Q50 by top Italian furniture designer and leather specialist Poltrona Frau will also be on display. There will be the Infiniti Podium Lounge tri-deck superyacht moored in the harbour for guests to party and watch the race on. Perhaps the real appeal of Infinity Podium Lounge Monaco is the chance to party with real race drivers, teams management and media. While the confirmed guest list is being kept under wraps, you never know who might show up perhaps a world champ or his younger Aussie apprentice as the Redbull team is heavily affiliated with keen sponsor Infinity. 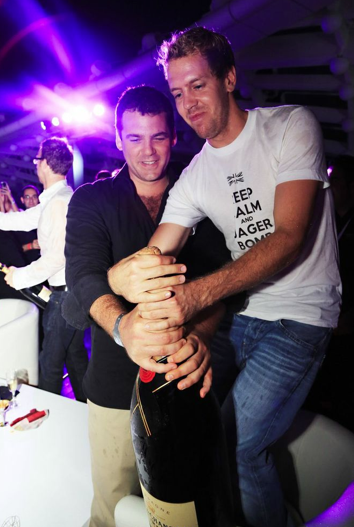 Formula 1 World Champion, Sebastian Vettel partying a previous Podium Lounge Event. 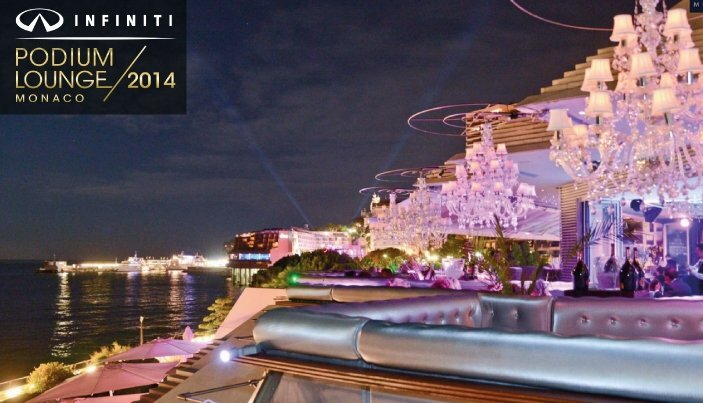 General admission price for the Infiniti Podium Lounge Monaco Party is 350 Euro per person, or 550 Euro for two, with both ticket options including a bottle of Moët & Chandon champagne on entry. VIP tables cost 2,000 Euro for four people in the VIP area and include one bottle of Belvedere and 1 Magnum (1.5L) of Moët & Chandon champagne. A private VIP lounge for 20 people costs 18,000 Euro and includes two Jeroboams (3L) of Belvedere, four Jeroboams (3L) of Moët & Chandon plus a ‘meet & greet’ with all the DJs & Performing Artists in attendance. 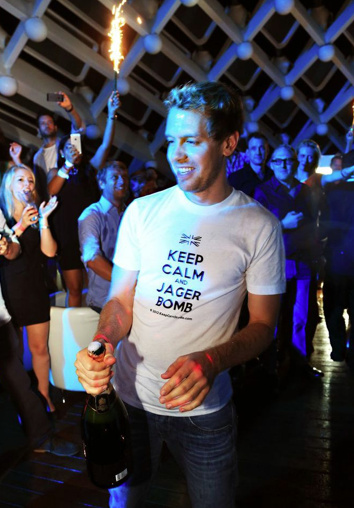 This entry was posted in Europe, Parties and tagged f1, Forumla 1, infinity cars, monaco, Party, podium lounge, sebastian vettel, travel, vip. Bookmark the permalink.